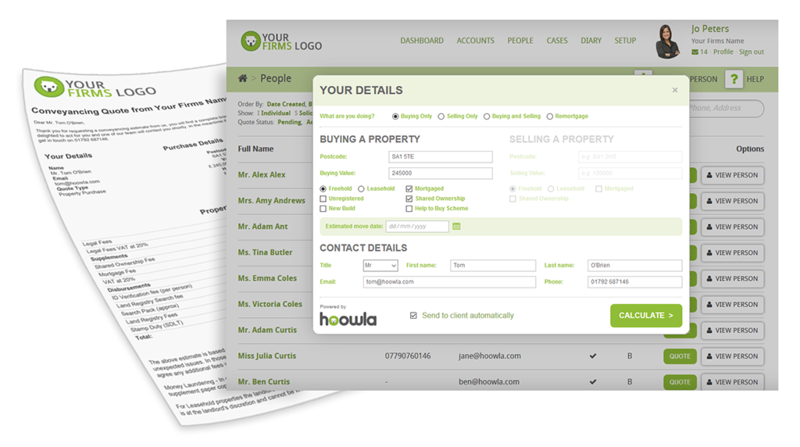 Hoowla have enhanced our case management software for the legal property market in Scotland. Hoowla’s conveyancing calculator automatically calculates Land and Buildings Transaction Tax (LBTT) and Land Registration fees when generating conveyancing estimates and quotes for clients. The Scottish legal system differs to England and Wales by applying different charging structures to conveyancing transactions via the Registers of Scotland. Land and Buildings Transaction Tax (LBTT) replaced UK Stamp Duty Land Tax (SDLT) in Scotland earlier this year. Hoowla’s conveyancing calculator lets you create compliant, professional conveyancing fee estimations, all in under a minute. It fit’s around your firm’s charging structure and your messaging and brand sits front and centre in all your quotes. There are no setup costs and the tiny annual fee makes it a no brainer if you’re looking to empower staff, save them time and increase business through your website. The calculator is free for customers using Hoowla’s full Legal Software.